Lina Khatib is the Head of the Middle East and North Africa Programme at Chatham House. On Monday, Syrian President Bashar al-Assad visited Tehran, only his third trip abroad since the start of the Syrian conflict in 2011, following trips to Russia in 2015 and 2017. Assad’s Tehran visit is largely symbolic, marking the declared “victory” of his forces with the support of Iran, but it can also be read as part of an escalating American-Iranian showdown that is playing out in Syria, Iraq and Lebanon. The visit came shortly after US President Donald Trump declared victory against the Islamic State group (IS). Trump boasted on Twitter that: “We have defeated ISIS”, with the “we” referring to the US-led international anti-ISIS coalition. Of course, Iran is not part of that coalition, but it has been justifying its own military intervention in Syria as being about countering what it calls “takfiri jihadis”, of which IS is a component. Trump’s statement- indirectly – completely dismisses this Iranian narrative. Iran is widely viewed in the West as a destabilising force in Syria, even by countries that remain committed to the nuclear deal with Tehran, which the United States withdrew from last year. Iran-backed militias, led by the Islamic Revolutionary Guard Corps and Hezbollah, have been fighting alongside the Syrian Arab army since at least 2012. Iran’s support has enabled Assad to survive the conflict, although whether Iran would have managed to achieve this outcome without Russia’s own intervention remains questionable. Iran – like Russia – firmly believes that IS and other “takfiri” groups are part of an American plot to destabilise the Middle East. Both Russia and Iran say they are intervening to stand up to American meddling and to stabilise the region. During Assad’s visit, Ayatollah Khamenei praised what he referred to as Syria’s “victory”, presenting it as another example of Iran’s victory – not against IS, but against American “plots” in the Middle East, according to Khamenei. The choice of the word “victory” is a direct response to Trump’s “victory” statement about IS. The tension between Iran and the US is not rising in the Syrian context alone. In Iraq, Iran-backed militias from the Popular Mobilization Units (PMUs) have recently started questioning the continued presence of American troops there now that the Iraqi government has also declared military victory against IS. Qais al-Khazali, a prominent PMU militia leader and politician, said in an interview with Reuters that he sees no reason for US troops to remain in Iraq. PMU fighters have been deploying in larger numbers to the Iraqi-Syrian border, saying they need to be there to support the Iraqi Army in securing the border and preventing an IS resurgence. Although President Trump announced that the United States is to withdraw all but 400 American troops from Syria, the troops that are leaving Syria are mainly going to be re-deployed in the Ayn al-Assad military base in Iraq near the Syrian border. 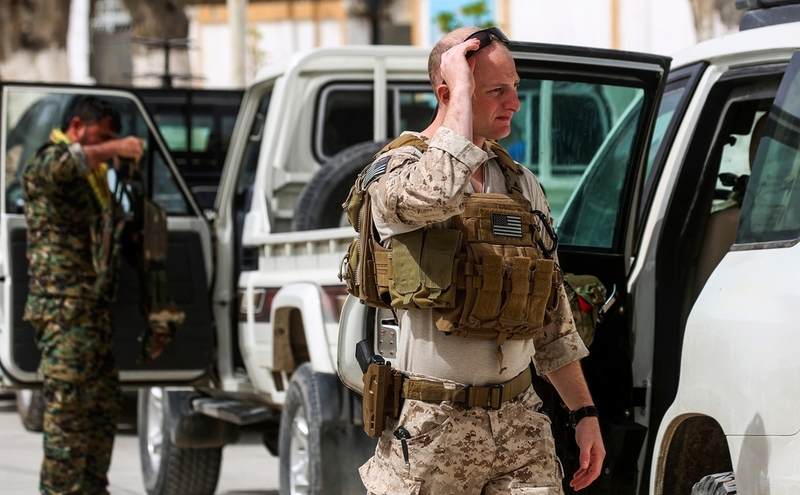 Keeping some troops in north-eastern Syria and augmenting the numbers present in Iraq is a way for the United States not just to continue the battle against IS insurgents but also to “watch Iran” from Iraq, as Trump declared in late January. This was not lost on Khamenei, who declared during Assad’s visit that the US plan to be actively present on the Syria-Iraq border “must be decisively rejected and resisted”. The escalation in US-Iranian tensions also extends to Lebanon. Coinciding with Assad’s Tehran visit, the UK announced on Monday that it was designating Hezbollah as a terrorist organisation. Previously, the UK had made a distinction between the military and political wings of Hezbollah. The UK is now following in US footsteps on the status of Hezbollah. UK Home Secretary Sajid Javid has announced that: “We are no longer able to distinguish between the already banned military wing and the political party”, while Foreign Secretary Jeremy Hunt added that the UK government’s action is a signal that Hezbollah’s “destabilising activities” in the Middle East “are totally unacceptable and detrimental to the UK’s national security”. The UK designation comes four months after the US announced it was imposing further sanctions targeting “foreign persons and government agencies that knowingly assist or support Hezbollah and Hezbollah-affiliated networks”, in the words of White House press secretary Sarah Sanders. Trump emphasised that the Hezbollah sanctions are part of the larger plan to increase pressure on Iran. Another major event coinciding with Assad’s trip and the UK’s designation of Hezbollah is the surprise resignation of Iranian Foreign Minister Javad Zarif. Many have linked the timing of his resignation to Assad’s visit to Tehran, which Zarif did not take part in, while noting the prominence of the leader of al-Quds Force and the architect of Iran’s interventions in Syria and Iraq, General Qassem Soleimani, in Assad’s meetings in Tehran. Soleimani’s rising public profile is an indicator that Iran’s response to pressure by the United States and its allies is going to be in the direction of taking a harder line rather than engaging in international diplomacy regarding its foreign policy and interventions in other countries in the Middle East. With both the United States and Iran standing firm in sending messages of no compromise to one another, it is likely that the nuclear deal will all but unravel further down the line and that prospects of engaging Iran in diplomatic talks on Syria or other Middle Eastern files are going to be dim.